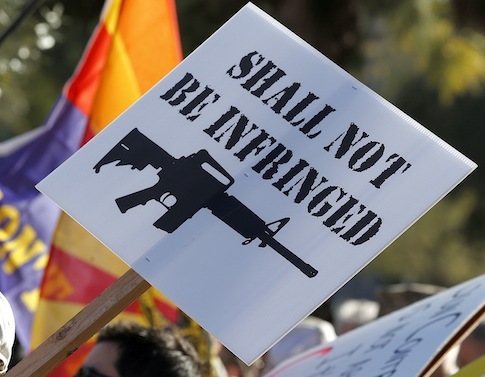 An appeals court took the case on Tuesday of a Phoenix, Ariz., business owner who claimed his First Amendment rights were violated when city officials tore down his gun ads. The case is being closely watched as it could have national implications on public property advertising and the censorship of ads by transit agencies. Alan Korwin paid for ads to be placed at 50 bus stops across the city in October 2010. The ads featured the phrase "Guns Save Lives" inside a red heart and listed Korwin’s website, which offers gun training, products, and services. The city said those ads "did not propose a commercial transaction" as outlined in city guidelines. A lower court ruled in favor of the city, but an appeals court agreed to hear Korwin’s case. Korwin said that the city arbitrarily censored his ads. "It’s pretty clear that the city is deciding what I can say and can’t say," he said. "That’s not my understanding of how free speech is supposed to work." When asked if he believed his ads were censored because they included the word "gun," Korwin said, "It’s certainly evident in the phone conversations I had. They told me it was controversial." Goldwater Institute attorney, Christina Sandefur who is co-counsel on Korwin’s case, said she believes "it went quite well," at the appeals court. She said the judges were "somewhat skeptical of the city" in its claim that the approval of ads was not arbitrary. Other ads approved by the city, according to the case filings, included the following: "Jesus Heals"; another that said, "Free Pregnancy Test"; a union ad that read, "Build Your Future"; and several others including, "Love is Sensual." Goldwater Institute said that the wording in all these ads approved by the city did not "propose a commercial transaction." Sandefur said the judges also took issue with the change of advertising guidelines by the city midway through litigation. "The judges called the city out on the standards that were changed midway, and their attorney couldn’t answer," she said. The city’s initial guidelines in 2009 said advertising, "shall be limited to speech which proposes a commercial transaction." Its new guidelines, issued in 2011, dropped "limited to" and now says, "A commercial transaction must be proposed and must be adequately displayed on the transit advertising panel." Sandefur said that by eliminating those two words the city set an even "broader standard" for advertisements. The city of Phoenix did not respond to request for comment. "They definitely did not give the city an easy way out," Sandefur said. "They understand the implications. This case could have implications beyond Arizona." "This case will decide whether the right to advertise on public property must be determined by clear, reasonable, and objective standards," Clint Bolick, vice president of litigation for Goldwater Institute, said in a statement. "The free-speech protections of the U.S. and Arizona Constitutions do not tolerate suppression of speech by bureaucratic whim.". The American Civil Liberties Union (ACLU) filed an amicus brief that said the case has "profound implications" beyond posting of advertisements. The group wrote the case "involves the scope of the Arizona Constitution’s grant to all persons of the right to freely speak, write, and publish on all subjects." The ACLU also pointed out that "the framers of the Arizona Constitution intended to rigorously protect the right of free speech, and therefore adopted language broader than the language contained in the U.S. Constitution’s free speech clause." Korwin believes his free speech was violated and wants his original ad back up. "We’re in our fourth year of being censored," Korwin said. This entry was posted in Issues and tagged 2nd Amendment. Bookmark the permalink.